1. Brissette, I., & Cohen, S. (2002). The contribution of individual differences in hostility to the associations between daily interpersonal conflict, affect, and sleep. Personality and Social Psychology Bulletin, 28, 1265-1274. 2. Cohen, S., Doyle, W. J., Turner, R. B., Alper, C. M., & Skoner, D. P. (2003). Emotional style and susceptibility to the common cold. Psychosomatic Medicine, 65, 652-657. 3. Cohen, S., & Lemay, E. (2007). Why would social networks be linked to affect and health practices? Health Psychology, 26, 410-417. 4. Doyle, W. J., Gentile, D. A., & Cohen, S. (2006). Emotional style, nasal cytokines, and illness expression after experimental rhinovirus exposure. Brain, Behavior, and Immunity, 20, 175-181. 5. Cohen, S., Alper, C. M., Doyle, W. J., Treanor, J. J., & Turner, R. B. (2006). Positive emotional style predicts resistance to illness after experimental exposure to rhinovirus or influenza A virus. Psychosomatic Medicine, 68, 809-815. To assess participants’ daily affect over a period of several (6 or 14) days. On each evening during the interview period, interviewers asked participants to rate, using a 5-point scale, the extent to which a series of mood adjectives described how they had been feeling since they got up that morning. The interview affect questionnaire is included on the second page of the PCS2 interview form and on the last page of the PMBC and PCS3 interview forms. *To facilitate data aggregation, PCS2 item scores have been converted to a 0 to 4 scale. The internal-reliabilities the multiple assessments range between 0.89 and 0.93 for state Positive Affect scores and between 0.87 and 0.92 for state Negative Affect scores (Cohen et al., 2003). Validity of the trait Positive Affect measure (i.e., average across days) is demonstrated by a correlation of .49 (p<.001) with a self-report questionnaire assessment asking participants to rate their “usual” levels of positive mood (Cohen et al., 2003). The 7 individual state affect scale scores were created for each interview day by computing a mean score across the items comprising each scale (see Table 1, top panel). 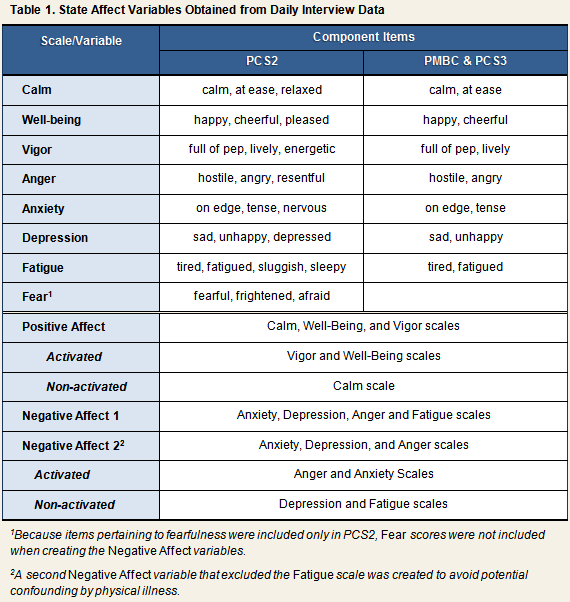 Composite state Positive Affect and Negative Affect variables were created by taking the mean of the relevant individual scales (see Table 1, bottom panel). Trait affect variables were created for the entire interview period by taking the mean across interview days of each of the 15 daily affect scores listed in Table 1.